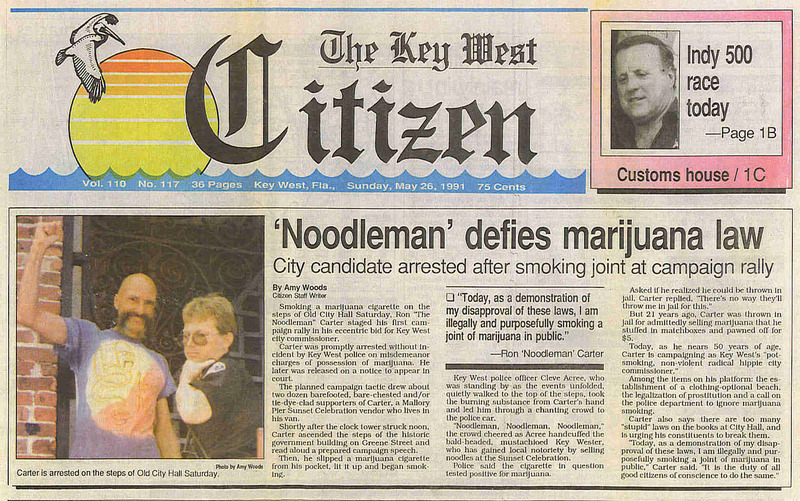 Smoking a marijuana cigarette, on the steps of Old City Hall Saturday, Ron, "The Noodleman" Carter staged his first campaign rally in his eccentric bid for Key West city commissioner. Carter was promptly arrested without incident by Key West police on misdemeanor charges of possession of marijuana. He was later released on notice to appear in court. The planned campaign tactic drew about two dozen bare-footed, bare-chested and/or tie-dye-clad supporters of Carter, a Mallory Pier Sunset Celebration vendor who lives in his van. Shortly after the clock tower struck noon, Carter ascended the steps of the historic government building on Greene Street and read aloud a prepared campaign speech. Then he slipped a marijuana cigarette from his pocket, lit up and began smoking. Key West police officer Cleve Acree, who was standing by as the events unfolded, walked quietly to the top of the steps, took the burning substance from Carter's hand and led him through a chanting crowd to the police car. "Noodleman, Noodleman, Noodleman," the crowd cheered as Acree handcuffed the bald-headed, mustachioed Key Wester, who has gained local notoriety by selling noodles at the Sunset Celebration. "Today, as a demonstration of my disapproval of these laws, I am illegally and purposefully smoking a joint of marijuana in public." Police said the cigarette in question tested positive for marijuana. Asked if he realized he could be thrown in jail, Carter replied, "there's no way they'll throw me in jail for this." But 21 years ago, Carter was thrown in jail for admittedly selling marijuana that he stuffed in matchboxes and pawned off for $5. 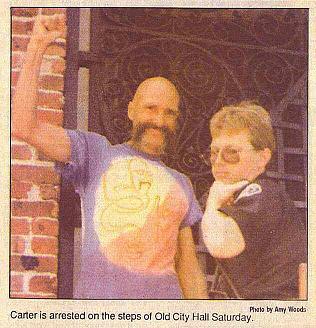 Today, as he nears 50 years of age, Carter is campaigning as Key West's "pot-smoking, non-voilent radical hippie city commissioner". Among the items on his platform: the establishment of a clothing- optional beach, the legalization of prostitution and a call on the police department to ignore marijuana smoking. Carter also says that there are too many "stupid laws" on the books at City Hall, and is urging his consituents to break them. "Today, as a demonstration of my disapproval of these laws, I am illegally and purposefully smoking a joint of marijuana in public," Carter said. "It is the duty of all good citizens of conscience to do the same."